You can usually tell you’re dealing with one of these puffed-up beasts (also sold under the Kenwhore label) because it’ll have the words “Even Heat” somewhere on the control panel. This dryer is a perfect example of how buying appliances with needless and overblown electronics is hazardous to your financial health. Dryers are simple, humble machines that do three things: tumble the clothes, get ‘em warm, and move a lot of air. Why would you want or even need an over-priced failure-prone “electronic control system” for a friggin’ dryer? I can almost understand it for a refrigerator or a gourmet oven, but a dryer? Putting an electronic control board in a dryer is like installing a GPS nav system on a kid’s tricycle. Enough! Stop the madness! Friends don’t let friends buy dryers loaded with over-blown electronic crap. dryer starts when the start button is pressed but stops running when the start button is released. Both problems, by the way, are a direct result of using an electronic control board and chintzy relays instead of a reliable mechanical timer and simple, rugged mechanical switches. So, as you expect, most of the time the problem is going to be either the Even Heat control board or the motor/heater relay (there are separate relays for motor and heater but they are the exact same part). But remember that electronic boards can- and commonly do– fail without any visible signs of failure. So just because an electronic board may appear okay, this does not mean that it IS okay. Otay, Buh’wheat? The relay coils are outlined in red. A good coil will have a resistance in the range of 2 to 3 k-ohms; a bad coil will either read infinite resistance or something in the mega-ohm range. The Even Heat control board sends 48 vdc to the relay coil to close the switch in the relay output. 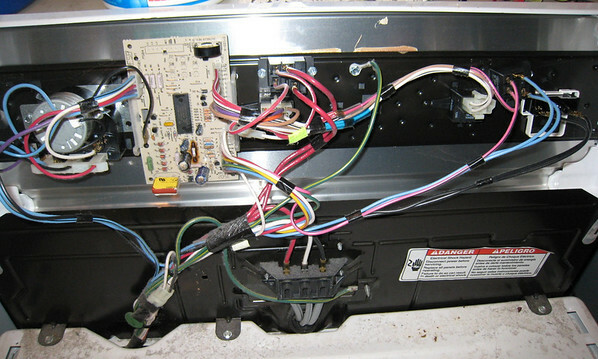 When the relay switch closes, it sends power to either the motor (in the case of the motor relay) or to the heating element/gas burner assembly (in the case of the heater relay). Armed with this knowledge, you can determine whether the Even Heat control board or the relay itself is causing the problem by doing exactly two simple tests on the appropriate relay. Let’s break it out by type of problem. Test 1: Measure the coil resistance on the heater relay. Remember: resistance measurements are made with power off the circuit, so unplug the dryer for this test. If the heater relay coil is open or very high resistance, replace the relay. Test 2: If the relay coil tests good, then we check for 48 vdc (that’s volts-DC– double check your meter setting when you measure for this) at the relay coil. This is done with the dryer running on a heated dry cycle and all the wires still attached to the relay. If you don’t get 48 vdc at the relay coil, replace the Even Heat control board. But what if you do get 48 vdc at the relay coil but still no heat? Then we may have a problem elsewhere in the heater. We can confirm this by verifying that the relay is closing its contacts when the coil gets voltage with another live test. Again, dryer running in a heated dry cycle, set your meter for the 120vac range and measure the voltage across the relay contact terminals (the ones with the heavy red wires attached to ’em). If no voltage reading, that means the contacts are closed and the relay is doing its job; so the heating problem lies downstream in the heating circuit. 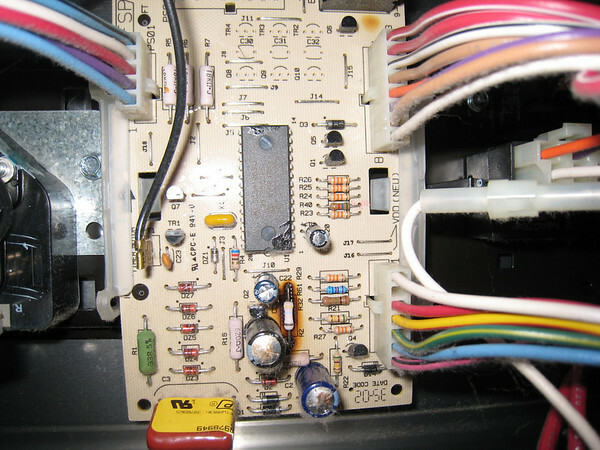 We can help you troubleshoot this in the Samurai Appliance Repair Forum. Same two tests as for the heating problem above except you do all the tests on the motor relay. That makes for a nice and easy symmetry, don’t it? If you get 48vdc at the motor relay coil but still the motor doesn’t run, then we have a problem downstream in the motor circuit to troubleshoot. 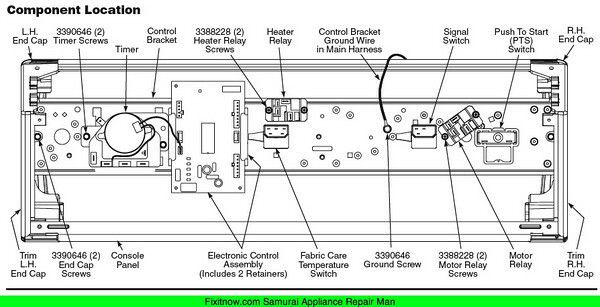 Again, we can help you with this in the Samurai Appliance Repair Forum. 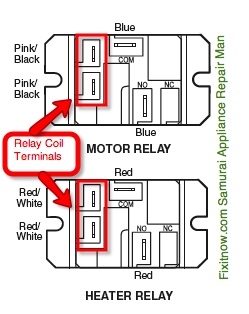 This entry was posted in Dryer Repair on March 17, 2009 by Samurai Appliance Repair Man.